Thanks for all who have decided to take on this challenge! What a great week it is going to be. You sore today? Hopefully! By the end of the week maybe you’ll start noticing changes. Side of your foot and forearm with your hips forward and up towards the sky. Hold pose 30 seconds and then flip to the other side and do another 30 seconds. Too difficult? Take a look at the modification. Just put the bottom knee on the ground. You’ll still feel it. Remember to never get overwhelmed if you can’t perform an exercise at first. There is ALWAYS a modification to fit everyone’s pace. So get to it! 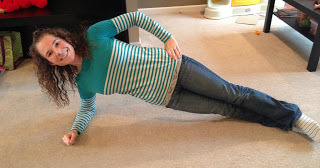 Happy planking on this day! 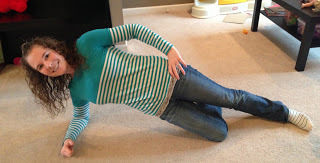 I'm amazed at how strong I have gotten by doing planks! I'm not doing the challenge though, because I'm already doing "Fab Ab February" everyday plus Lindsay Brin's new workouts. 🙂 Hopefully I'll be able to hold a plank for 2 minutes by the end of the month!! Keep up the good work, I'm still reading!